After searching for weeks on the net for the tent that would best suit our needs for the Africa Trip, we cam across the NEMO ESPRI two person tent which is light, well built , has pockets, and taped seams to keep you dry. 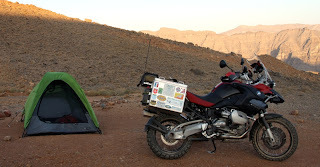 I would buy the tent just for the excellent customers service, when I ordered three tents for all three of us I got an email from them just to confirm that I didn't make a mistake. Now how often has that happen to you ? to me never , and I order almost every thing for the guys. 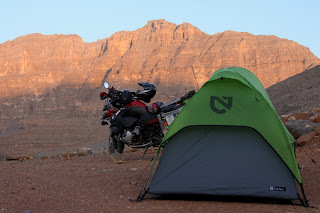 I recently took a trip to Musandam in Oman and tested the tent in the mountains it did what it was supposed to do, and slept with a clear view of the mountain in front of me. It is a very versatile three season tent and has room for me and my stuff inside, you can use just the tent to have a meshed roof when the weather is worm and dry , or cover up with the water proof cover.